I get that he's basically trying to bring back Mega Man but come on he could have been a tad more original. It plays exactly like Mega Man. Beck basically looks like Mega Man. Beck's sidekick who does the same thing as Roll and looks like her too. Has a red robot dog. Looks at the rest of the concept art and sees villains that look like Dr. Wiley, the other numbered robots that look like Mega Man bosses and a mettaur that had his helmet replaced with a traffic cone. Me: He could have at least tried for some originality I get that he wants to bring back Mega Man but when he does this it just makes us think about the fact that the blue bomber is dead and all we get is a re-skinned replacement that's just going to keep reminding us that he's gone. Also it came off as lazy to me. It's kind of made me think about how they make those Chinese toys that are just rip offs of the actual toys. The likeness might be a problem. Everything from logo to concept art screams mega man. I wouldn't be surprised if Capcoms forces some radical changes and he has to redesign everything. WE'VE REACHED $900,000! NOW LET'S GO FOR THE STRETCH GOALS! Did you read the kickstarter or watch the video? Or did you skim down and glance and just judge that it was a reskin. Yeah I am not saying it is going to be super original, but he said it was a spiritual successor and it looks like they are applying enough things to make it different. The unofficial fan-art blog has began! 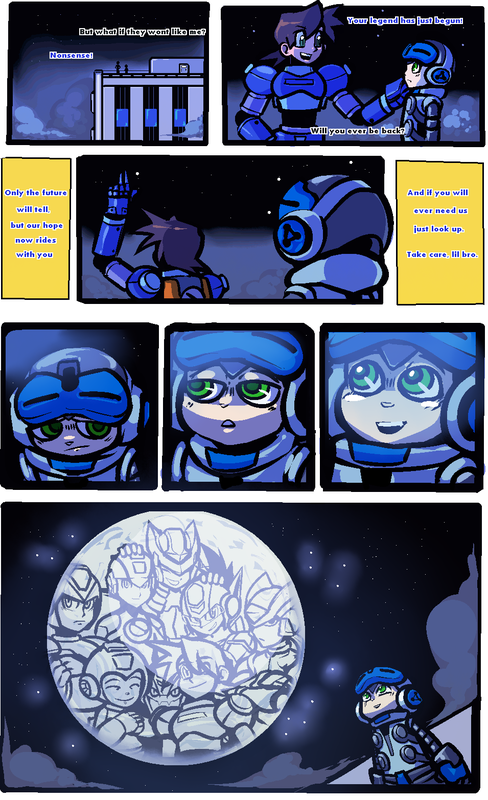 @tebunker I did watch the video and I read it btw, yes I know it's a successor and Mega Man was his original work (so he's not really copying anyone etc.) but seriously this could have been his chance to do something a little more different but everything's just the same but with a disguise. Not saying this game is going to be terrible or anything like that (IDK if that's what you got from my post and it might have offended you or something and for that I'm sorry, I don't like to start pointless internet arguments I just like to post my opinion like anyone else not trying to offend others). I'm just saying he could have flexed his creative muscles a little bit more. It's been 3 days, and there's already some really great fan art? Geez, how do people do that so quick? I'm just saying he could have flexed his creative muscles a little bit more. At the risk of sounding rude, I would just ask: Why? When you first start out, whatever kind of artist you are, you push boundaries. Why? Because you have to. You are an individual. You have something unique to say. And you need to push boundaries in order to say it, because nobody's ever said it before quite the way you will. As you continue to grow as an artist, you need to push fewer and fewer boundaries. Not because you have less to say, but because you've already carved out a space in which you can say it, and a space in which folks are comfortable when you say it. You can't keep pushing boundaries forever, because if you do you're pushing them for the sake of pushing them. And that helps nobody. It does no good to push boundaries because, hey, might as well. That's when you've officially started trying too hard. You push boundaries when you need to push them. When you don't, you do brilliant things WITHIN boundaries. And there's no serious artist alive that would tell you any differently. Quite how "quality" and "boundary pushing" started going hand in hand in the mind of gamers is beyond me. I'd rather have a great game that pushes no boundaries than a mediocre game that pushed boundaries that did it no good. One of them I might admire in some sort of passing way for what it attempted to do...but I know which one I'd actually spend my time playing. IDK I guess I just expected more from the guy that criticizes the Japanese gaming industry for not being creative and taking risks. But I'll consider the idea you have just presented to me. That is all I could ask for, of course. Well, he's not trying to be creative too much with this. He's literally just trying to give us more Megaman. Or better put, revitalize side scrolling shooters like Megaman. King of the Pirates was different and that's his game. Don't be mad bro, you like dolls and I like game boxes and manuals. Going to back this later this month mostly because it Infuane and dude is awesome. Hate that he's going PS3/360 instead of PS4/One however. Still the Wii U will probably be the system it feels most as home as. 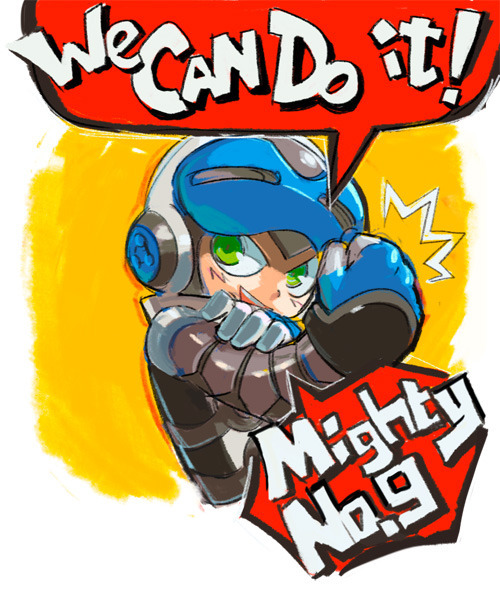 I'lll probably kickstart so I can vote on stuff like MML3 would have. It looks like they've lowered the stretch goal to $2,200,000 to get it on Wii u!!!! !